The US backed-Saudi-led coalition launched an offensive on Hodeidah in the largest battle of the war that the United Nations fears risks triggering a famine in Yemen where an estimated 8.4 million people are on the verge of starvation as the Yemeni army forces keep responding to its constant offensive. A child was killed and a citizen was injured by the coalition paid fighters in Hodeidah province.They launched an artillery shell to a farm in Duraihmi district, killing a child and wounding a citizen. The coalition warships destroyed a building near a Historic castle on the coastal line in Howk district. The Yemeni air forces ,on the other hand, conducted drone strikes on the coalition paid fighters in Yemen’s western coast, that hit the coalition command center in Ambarah military camp, and huge explosions were heard inside the center, hitting their target accurately, and killing and injuring dozens of the paid fighters, including military commanders. Artillery force of the Yemeni army forces , for its part, shelled gatherings of the coalition paid fighters, killing and wounding scores of them during the shelling in Tuhaita district of Western coast front. On Monday, the Military Media published scenes of the qualitative luring operation carried out by the Yemeni army forces, which drew several battalions of paid fighters of to a deadly point. 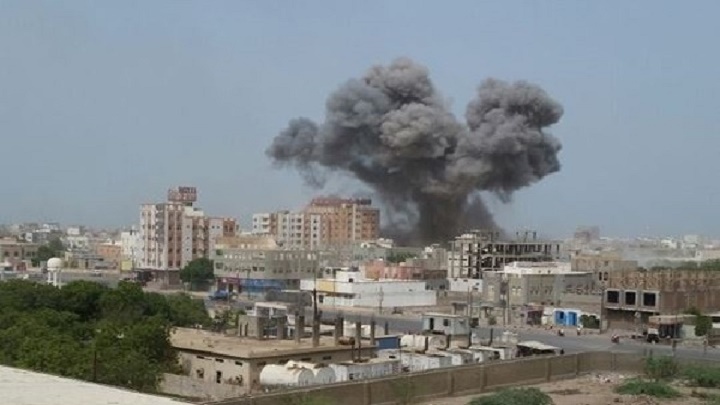 The scenes showed that the Yemeni forces burning and destroying several military vehicles and armored vehicles with guided missiles, improvised explosive devices and other guided weapons. A southern commander in Amalekia Brigade revealed ,yesterday, said that the UAE has abandoned a full battalion after it was trapped by the Yemeni army for 3 days in Drehemi district of Western Coast Front. The official spokesman of Ansarullah, Mohamed Abdul Salam, on Tuesday commented on the relationships and ties between the United Arab of Emirates (UAE) forces and the terrorist organization al-Qaida in Yemen, saying that the coalition is in desperate need of paid fighters, and this need led the UAE to build a relationship with al-Qaida and it deepened its relation which is sponsored by Washington. A mass march took place, yesterday afternoon, in Hodeidah province, under the slogan “Your crimes will not pass and our blood will prevail. In the demonstration, they raised slogans condemning the crimes of the coalition and its paid fighters, which lasted more than three years. The most recent was the massacre in the fishermen’s market and the General Revolution Hospital in Hodeidah. Hodeidah is a strategic port city which should be supporting more than 20 million Yemenis. It should be the source of at least 70 percent of all imports to Yemen,” Suze van Meegen, a protection and advocacy adviser with the Norwegian Refugee Council, told AFP. The US backed-Saudi-led coalition has been eager to retake from Yemeni joint forces control, according to Yemeni officials.. But the former UN special envoy to Yemen, Ismail Ould Cheik, warned against attacking the port city over potential catastrophic consequences to Yemen last year. Martin Griffiths, the new special envoy to Yemen, echoed the same concern over attacking Hudaydah at the UN Security Council . The United Nations children’s agency, UNICEF, has warned that a fresh cholera outbreak is spreading quickly in Yemen’s vital seaport of Hodeidah, amid ongoing attacks by the coalition against the besieged provincial capital. Humanitarian organizations have warned that the Hudaydah operation threatens to cut off essential supplies to millions of Yemeni people. More than 70 percent of Yemen’s imports pass through Hodeidah’s docks.